What’s better than a tender, warm out of the oven biscuit? I know it’s hard to imagine that there is ANYTHING better than that, but consider this: a tender, warm out of the oven biscuit that is laced with Vermont cheddar cheese and fresh chives and a generous amount of cream cheese. Ponder that for a minute. Ready? Here it comes. I should pause just for a second here and say that I know I have been using this posting time each week to update you on our Great Kitchen Project, and after just under four weeks, we are just about done. Done enough for me to be back to cooking in my kitchen, done enough for me to be sitting at our lovely new island typing this post, done enough for me to have put all my one million things back in my nice new drawers. However, there are still a few odds and ends that need to be finished up before I can unveil the whole thing for you, so bear with me for a few weeks until the kitchen is totally ready for its close-up! Meantime, back at those biscuits, this recipe was lightly adapted from one of my favorite sites, the King Arthur Flour folks. (And just for the record, the King Arthur folks have never heard of me or this here blog…this is my complete unbiased opinion!) I’m lucky enough to be able to buy my King Arthur flour right in my local market, but if yours doesn’t carry it you can either use regular flour or you can click here to order it. (They have a whole lot of wonderful recipes you can explore as well!). Meanwhile, back at this recipe, along with your flour and some of the other usual biscuit ingredients, you are going to want some fresh chives, some grated cheddar (I love Cabot!) and some cream cheese. The biscuit dough is nice and easy to make – no rising or kneading or any of that other intimidating stuff. You don’t even need a biscuit cutter if you don’t have one – I simply patted mine into one big square and then cut them into a bunch of smaller, biscuit-sized squares. 15 minutes in the oven and you have a warm, wonderful, cheesy, chivy basket of biscuit heaven. And pretty soon I will have a completely done kitchen to make them in! Happiness all around. Preheat the oven to 42 Whisk together the dry ingredients (including the cheddar) until everything is well combined. Use clean hands to work the butter and the cream cheese until it is nice and crumbly. If there are a few larger crumbs, that’s even better! Add the milk and mix with a fork. The dough is still going to be a little crumbly, but pick up a little bit and press it together – it should stick together. If not just add a little bit more milk until it does. Put the dough on a floured silicone mat or other surface and mix it together a little more with your hands until it is all holding together. Pat it into an 8-inch square and cut it into 2-inch squares, or if you like your biscuits round you can use a biscuit cutter. Place the biscuits on an ungreased baking sheet. Bake for 15 minutes or until golden. Serve nice and warm. On behalf of the farm families who own Cabot, thanks so much for the mention!! These look absolutely delicious! Need to find and try King Arthur Flour, but, I am a huge fan of Cabot Cheese! I got kind of obsessed with biscuits at the end of last winter and I kind of feel that coming on again after seeing these! SO excited to see the new kitchen btw. The biscuit obsession. I know it well…. I shouldn’t be saying this “out loud” but this Southern girl is terrified of biscuit making! I can make some killer artisan breads in my dutch oven (i finally tackled my fear of yeast a few years ago) but biscuits terrify me. Perhaps I know I can never make them as good as my Dad who learned it from his fireman friends (if you ever want a great biscuit, go to a fire house). This recipe makes me alot less scared. Thank you for sharing it. I can’t wait to see the kitchen. VERY exciting!!!! I bet this recipe will win you over! And I’m working away on the kitchen post – another week or two, I promise. 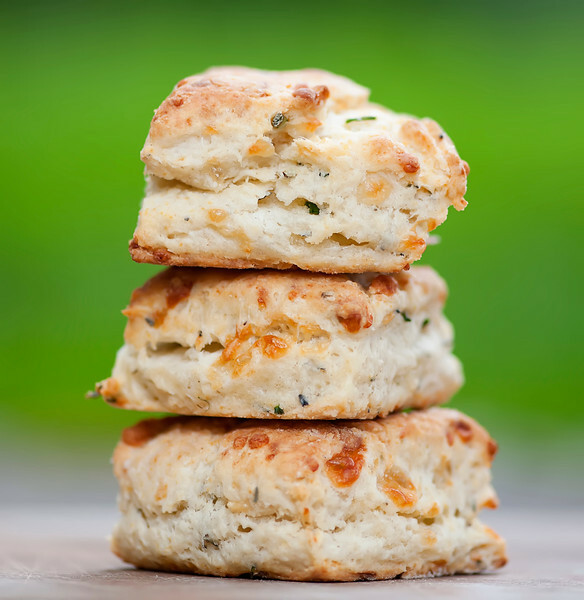 Oh yum, these biscuits are perfect :) chive and cream cheese, perfect!